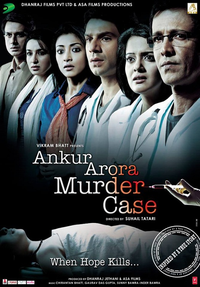 Review Summary: ANKUR ARORA MURDER CASE illustrates and spotlights on the gaffes in the medical profession most persuasively. ANKUR ARORA MURDER CASE illustrates and spotlights on the gaffes in the medical profession most persuasively. They say truth is stranger than fiction. It is also more cruel. Each time such incidence happens it calls into question whether death of a patient can be attributed to incompetency of the medical staff or whether they did their best to save a precious life. Sloppy editing coupled with soulless dialogues and unneeded adherence to cliches play spoilsport in the film. A surgeon slips up in an operation theatre. The truth is squashed. Will the victim’s family get justice? Or will the doctor get away with murder? To give him credit, the reputed doctor only wants to save his hard-earned reputation and position in society. The fate of Ankur Arora Murder Case gets murdered by filmmaker Suhail Tatari who despite a good story fails to deliver a crackling film.